Geneva, 10 June 2015 – In the Declaration released on 8 June following the two-day annual summit in Elmau, Germany, leaders of 7 of the world’s major industrial nations reconfirmed their commitment to fight illegal wildlife trade. The G7 Leaders specifically stated that “we are committed to combating wildlife trafficking, which is pushing some of the world’s species to the brink of extinction and in some instances is being used to finance organized crime, insurgencies, and terrorism.” The CITES Secretariat warmly welcomes this renewed commitment by the G7 Leaders. 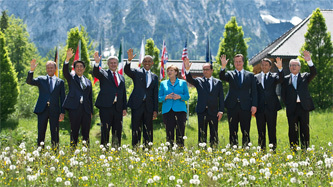 The G7 Leaders also recognized the need to tackle “environmental protection in global supply chains” and “the joint responsibility of governments and business to foster sustainable supply chains”, and emphasised “the importance of strengthening the system of multilateral treaties”. As a part of the on-going efforts to fight illegal trade in wildlife across the entire illegal supply chain, CITES and IATA earlier this week signed an MoU that commits each organisation to work together in combatting this illegal trade. CITES Secretary-General John E Scanlon also addressed the Annual General Meeting of IATA on 8 June on ‘Air transport and Illegal trade in wildlife’, where he stressed the role that can be played by airlines in disrupting the illegal supply chain through providing intelligence of anything that looks suspicious to authorities. The G7 Leaders’ commitment to fight wildlife trafficking is placed under Fighting Terrorism and its Financing in the Declaration. The Leaders hereby committed to “effectively implement the established international framework for the freezing of terrorists’ assets, and will facilitate cross-border freezing requests among G7 countries.” “Following the money” is believed to be one of the most effective ways to hit the wildlife trafficking gangs by cutting off their financial sources. 2015 will be a milestone year for international sustainable development issues. The important role of CITES was recognized in The Future We Want adopted at Rio+20 as ‘an international agreement that stands at the intersection between trade, the environment and development, and promotes the conservation and sustainable use of biodiversity’.